DES MOINES | Newly elected Iowa Democratic Party Chairwoman Andrea "Andy" McGuire pledged Saturday to build a unified, inclusive party that will appeal to more Iowans and address weaknesses exposed by heavy losses to Republicans in the 2014 midterm election. 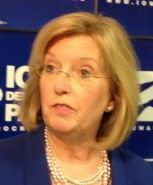 "I'm not looking back, I'm looking forward," McGuire told reporters shortly after her party's state Central Committee chose her to lead the party for the next two years. "We have to build the party in every corner of the state, in every county." McGuire, 58, a Des Moines doctor, mother of seven, business leader and former 2006 statewide candidate for lieutenant governor, was named party chairwoman on the third ballot in a contested race with Kurt Meyer of Ansgar, Tim Tracy of Carroll and Jim Mowrer of Boone, who ran unsuccessfully against U.S. Rep. Steve King, R-Kiron, in Iowa's 4th District last election. She succeeds Scott Brennan, a Des Moines attorney who did not seek re-election after serving two separate stints as the party's state chairman. McGuire said she planned to be a strong leader, a top-notch fundraiser and a party builder. She said her party needs to study its 2014 losses and hone its message heading into the 2016 election cycle, which includes gearing up for Iowa's first-in-the-nation caucuses over the next year. All four of the Democrats vying for the top leadership spot Saturday said the party's message needs to be delivered better, a message they all say is still popular with the American people. Several also made the point that Democrats, especially in rural areas, feel they are overlooked by the party establishment. "If you want a grassroots party, you've got to tend to the turf," said Meyer, who is from Mitchell County and co-chairs a three-party organization in northern Iowa. "There are big swaths of our state right now that do not feel like they are either listened to or heard. That is something that we must address right now. We must expand our party, we must energize our party, we must engage our parties in ways that we didn't in this cycle." Linda Nelson, a former state representative and teachers union president who backed McGuire's candidacy, said, "It's not where you're from, it's what you do." She noted that McGuire was the only one of the four candidates who has been part of a statewide campaign, saying, "She talks the talk and she's also the only candidate running today who has walked the walk." McGuire, president of Meridian Health Plan, said she planned to meet with her three competitors to get their ideas on how to improve the party and make it more effective because they raised valid points and criticisms during Saturday's meeting. Tracy, a county party co-chairman from Carroll County, said he is concerned there are more "extremists" in Washington, D.C., but added, "That doesn't mean they're going to get their way." "The squealing you're hearing in Washington today are the Wall Street hogs that are trying to get their nose in the trough and get ahold of your money, and we're not going to allow that as Democrats," Tracy said. "That's the message that we're going to take across the state." This week's show features discussion on potential presidential candidates visiting Iowa, the back and forth between Rep. Bruce Braley and State Sen. Joni Earnst in the Senate race, and potential changes to the Iowa Caucuses.